Excellence in the Community presents free weekly concerts at the Gallivan Center and other venues. 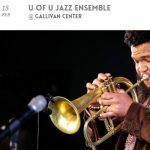 Don't miss the U of U Jazz Ensemble on February 13. Admission is free!